I managed to miss the Up&down buttonhole on the first TAST challenge.I got caught here. 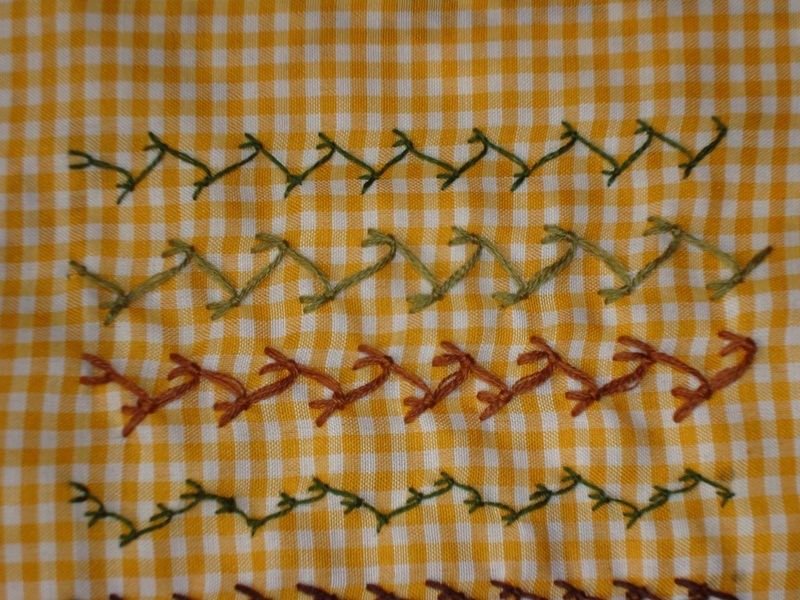 Initially thought this was a hard stitch,but later found this was not so. 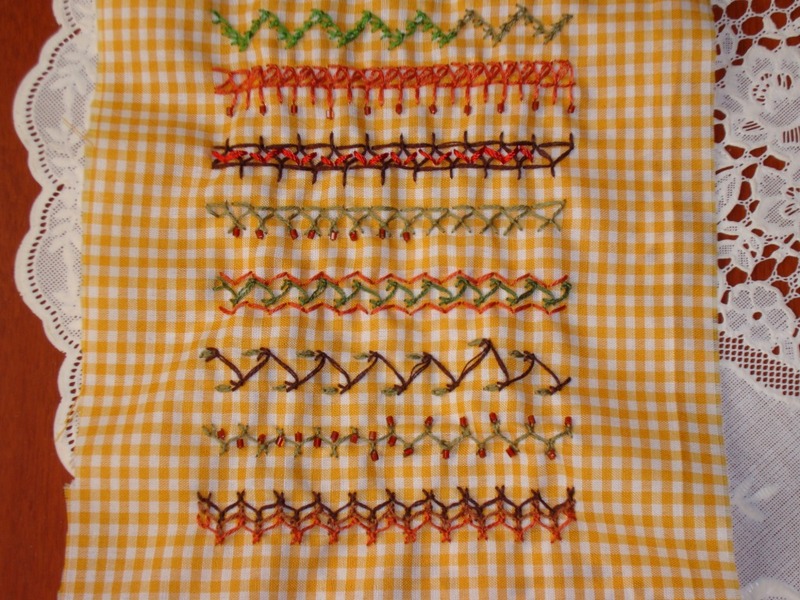 this sampler is also on checked fabric, I had some gingham cloth left over from stitch explorer challenge, chicken scratch. I tried the stitch in ,2, 4,and 6 strands,then did a 3-step feather stitch. I extended the 2nd stitch on this row. Made the second stitch shorter than the first. Did the stitch in 2 colours. In this row, I went down twice[LOL]. Going down twice, added some bugle beads too. Now thought, How can I use this stitch on closed feather stitch? Mixture of closed feather stitch and up&down feather stitch, with beads too. Here I added arrowhead st on top and bottom. Stitched beads at different points on this row. 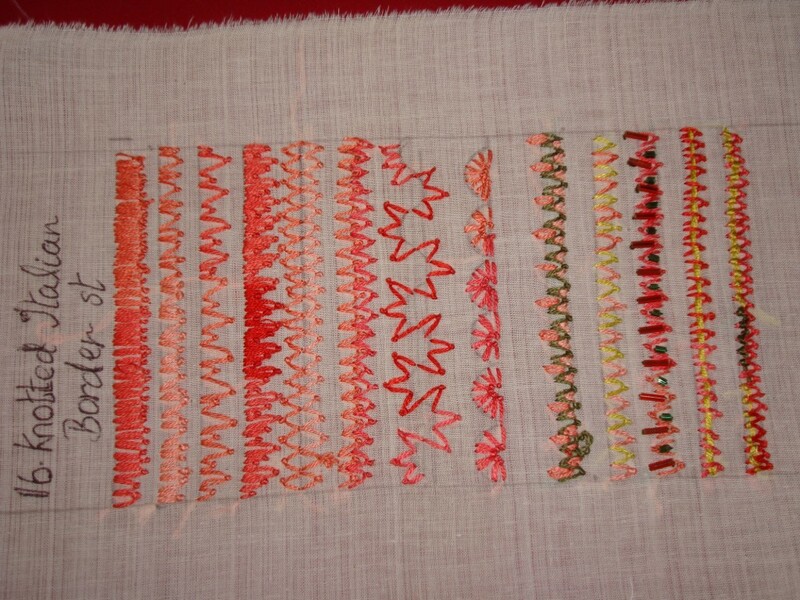 Three rows of this stitch,This could have been used for up&down buttonhole stitch too. 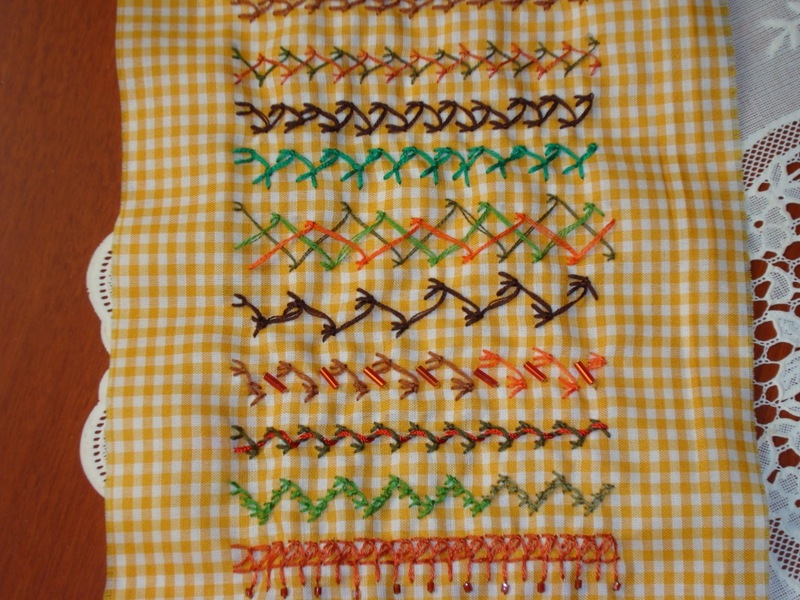 On this following part of this sampler, a part was left out of the close up. 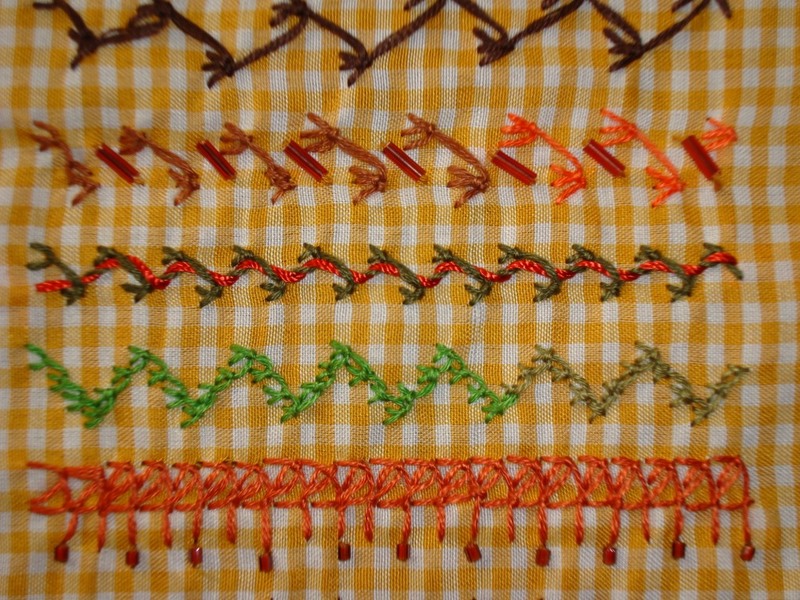 this was an easy stitch.And I enjoyed doing these variations. My personal library of stitches is growing. 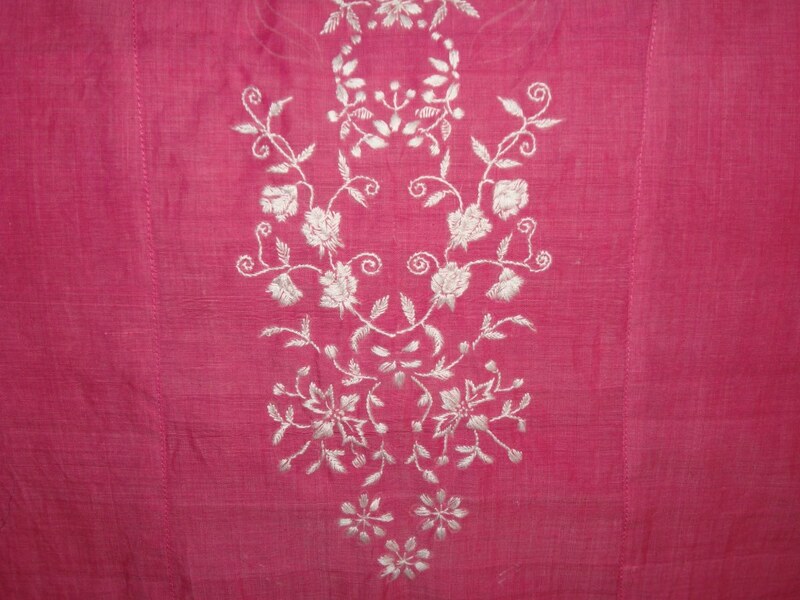 White embroidery on pink tunic. While browsing the antique pattern books downloaded from the antique pattern library, I was fascinated by some embroidery designs done in white on bonnets. Such wonderful patterns. And I wanted to use them . I had a stitched pink tunic with a white printed salwar. The E-book did not have patterns, only the embroidery. So I made a choice of the design and the stitches. 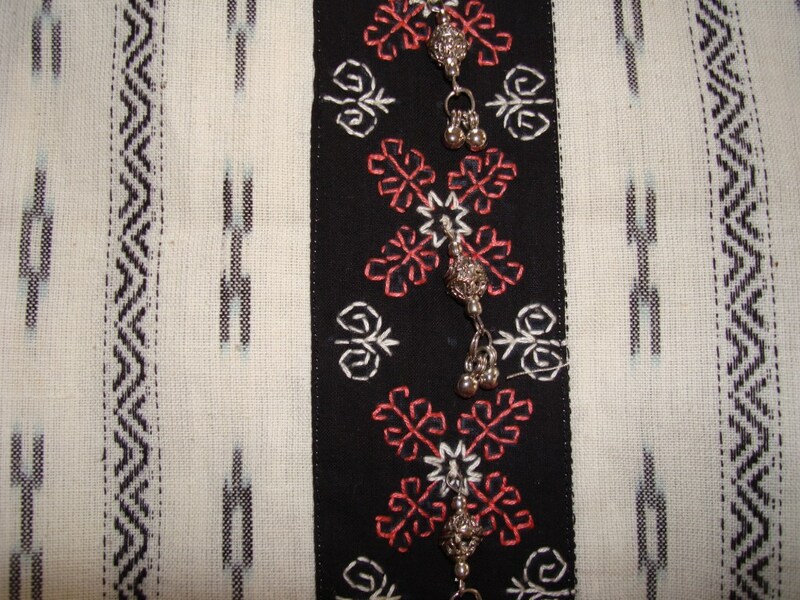 These I incorporated on a symmetrical yoke pattern.After tranfering the pattern to the tunic,I did the embroidery. 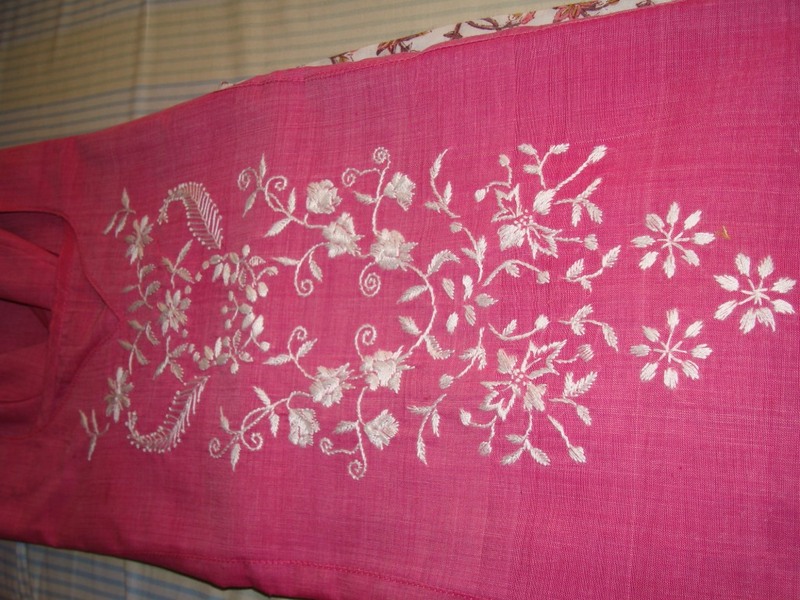 the fabric is handloom cotton in plain pink. 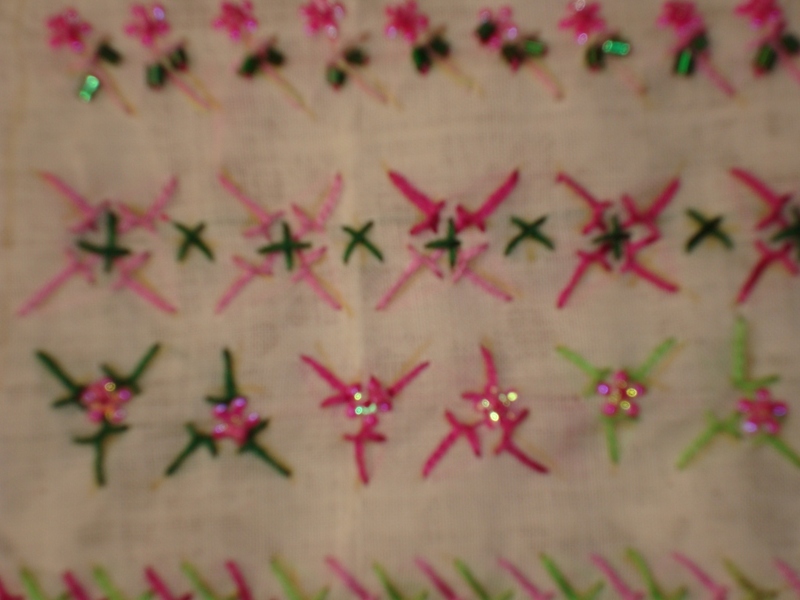 The embroidery work I did was not perfect by any standards.So what ? This ‘ll be one more excuse to do more embroidery. 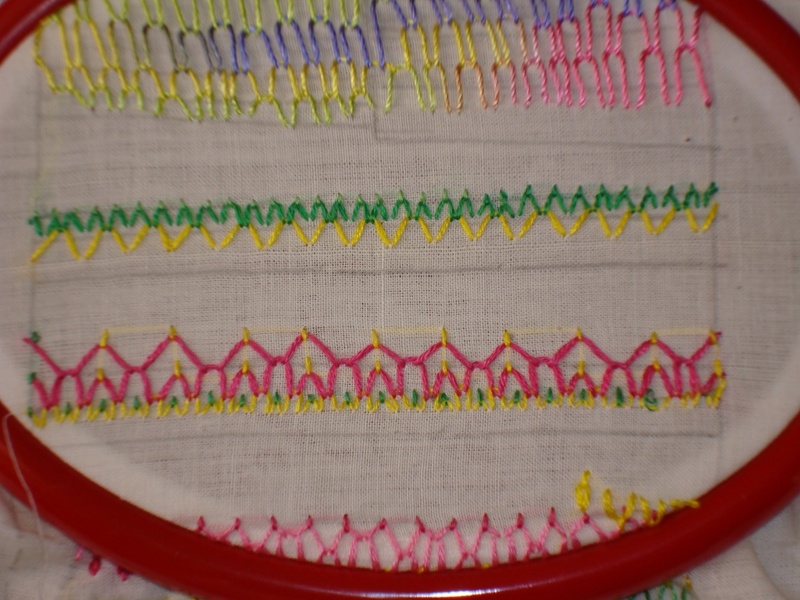 While visiting Sharon’s blog I read that there are some interesting things going on stitchin fingers.Do pop over there and see. the first challenge on”post a photo of—” is couching. 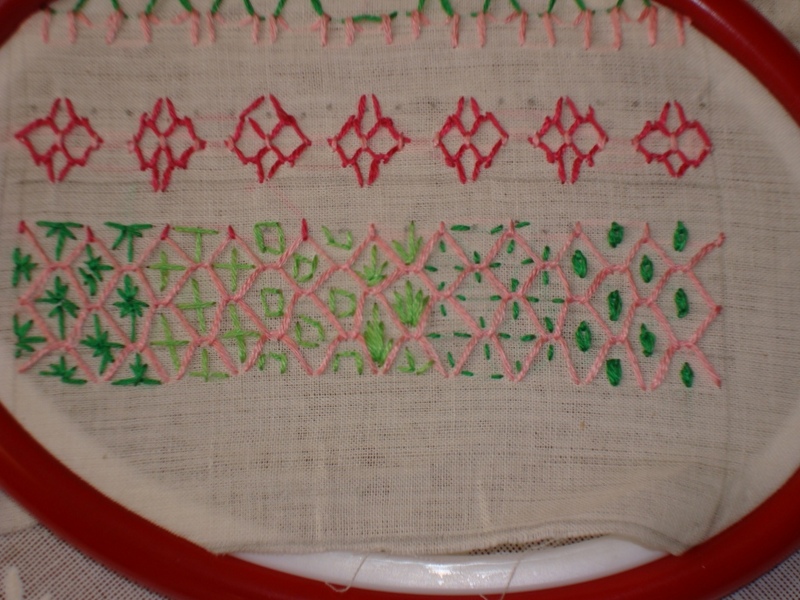 I don’t have any photos to post.I have done earlier kashmiri couching stitch on a green silk tunic.I don’t have the pictures.I wanted make a sampler of the kashmiri couching stitches, while doing the first TAST challenge.Haven’t done it though. While visiting this Shawki’s blog today,I found some thing interesting.There are free projects here. 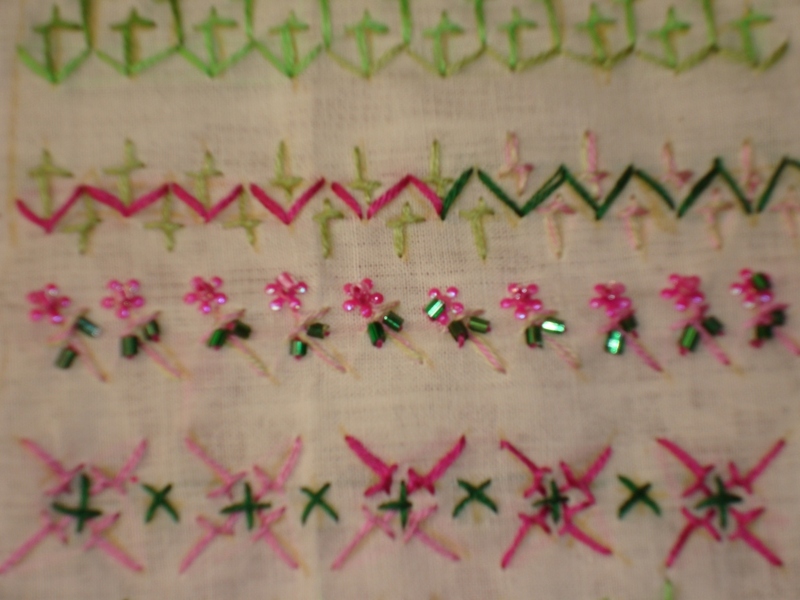 This embroidery I did in 2008.The tunic fabric is printed crepe in green. 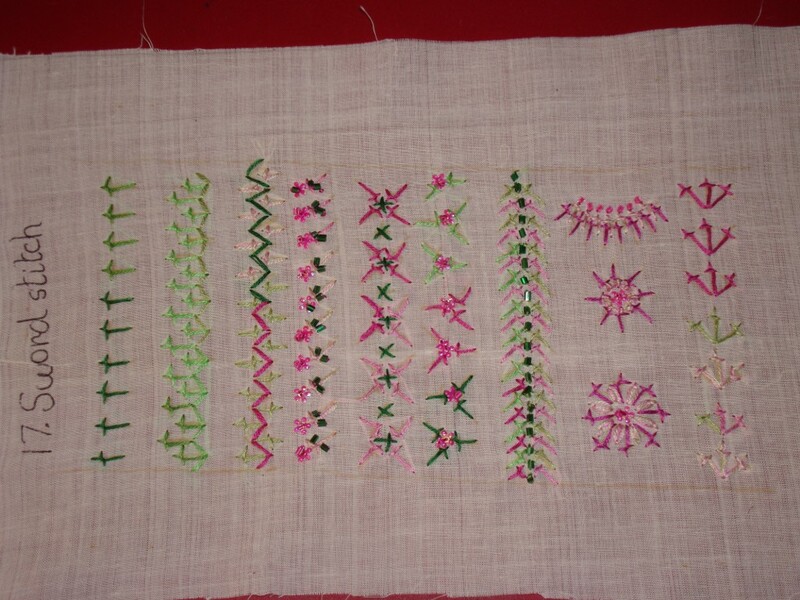 1-I did the embroidery on a different piece of cloth[cotton]. 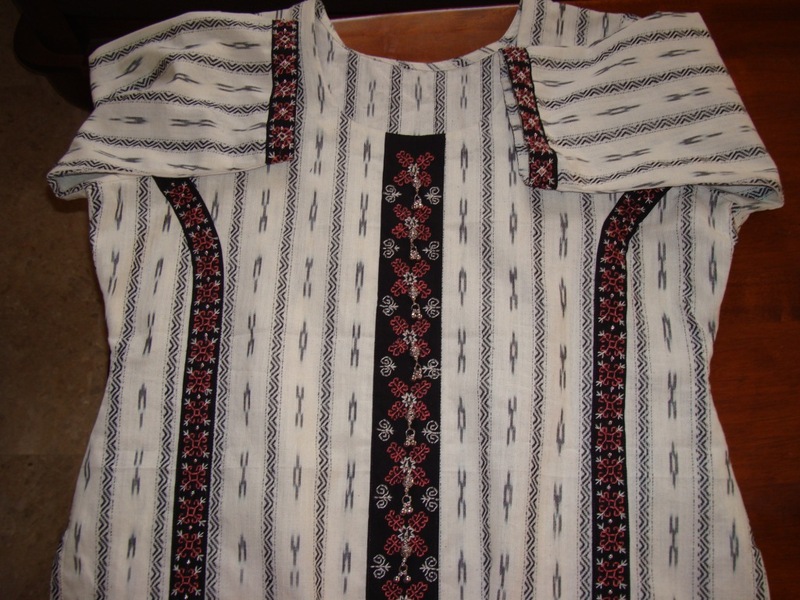 2-I gave lining to the tunic, so that it maintained its shape. the embroidery did not have many contrasting colours. 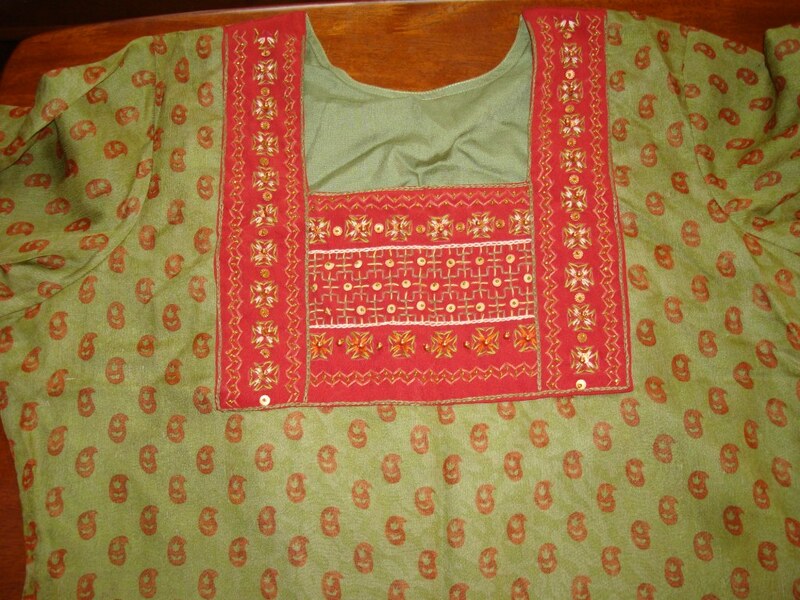 I was quite happy with the embroidery, pattern, stitching of this tunic.I am wearing it as a salwar top now. I do seem to have lots of green tops, though! Iam happy about , the name of this week’s stitch is short. 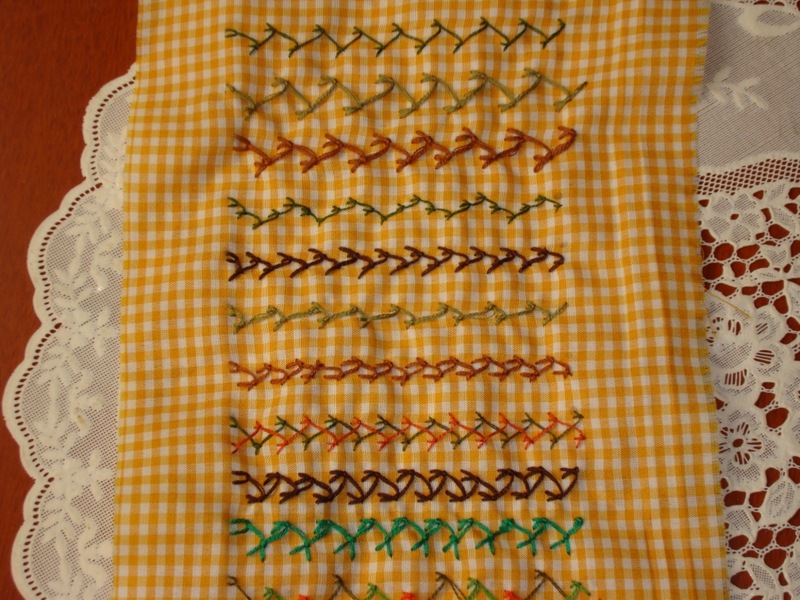 This is the 17th week of the stitch challenge TAST 2010 by Sharon B. 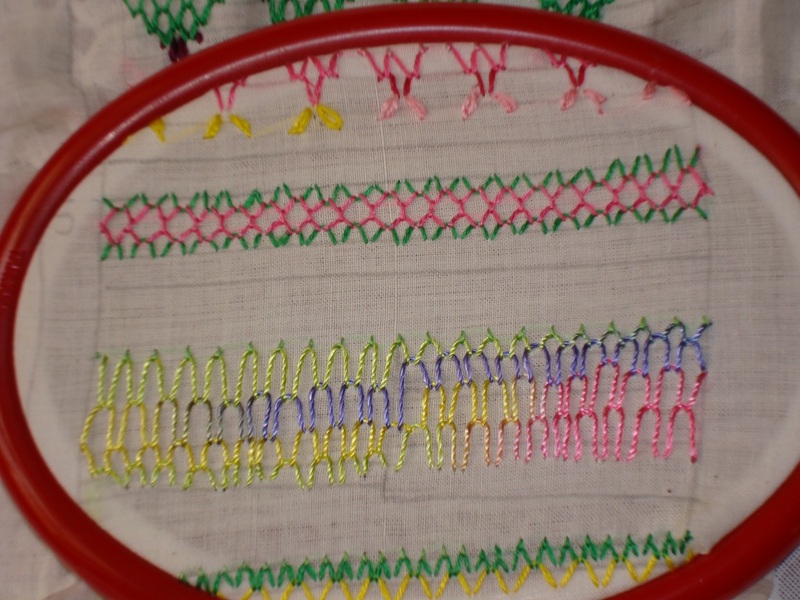 .As Iam working all the stitches in a band form,I tried doing this individual stitch also in rows. 1st is always a learning line. I did a row of arrowhead stitch,and placed the sword stitch on the peaks and valleys. 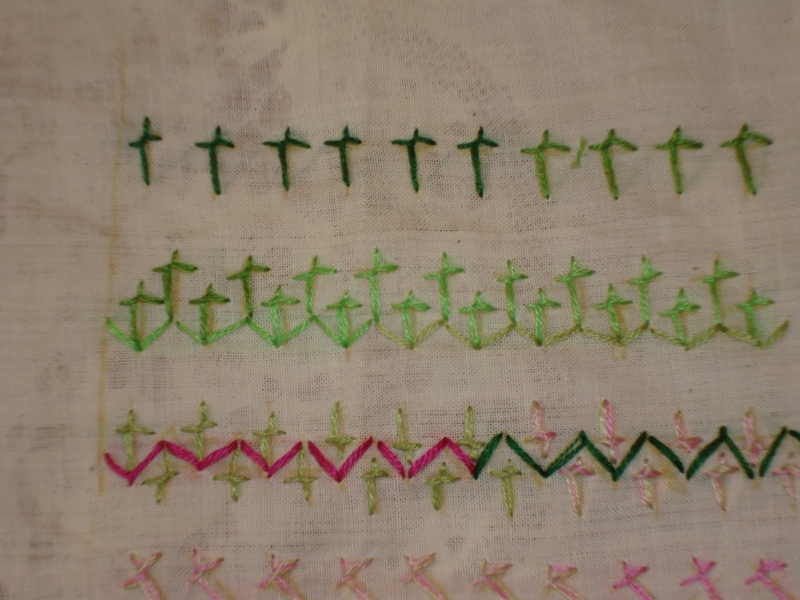 3rd row is also arrow head stitch,with the sword stitches facing each other. This row of sword st is leaning towards the left, I added floral sequins and some beads, and as you can see,I bungled with the beads. In this , 4 sword stitches are starting from the center , where an upright cross stitch is done, I finished this by adding few cross stitches, in between. 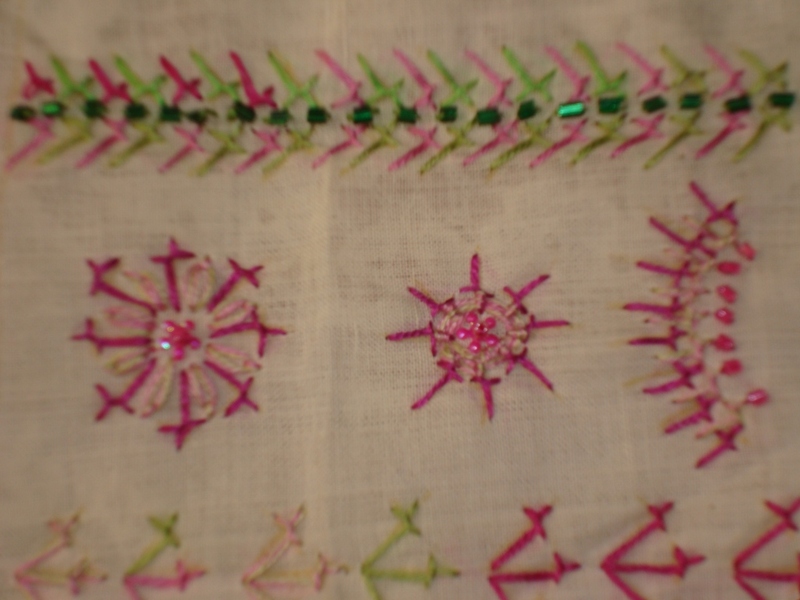 3 sword stitches are starting from the center with sequins.The photo is not good. 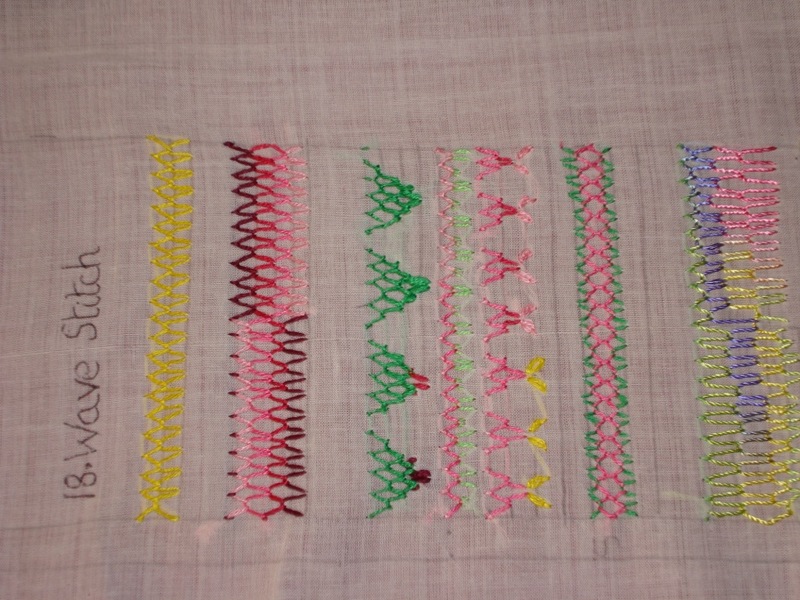 I did these 2 rows of sword stitch in 2 colours,to make it more decorative,I changed the angle of the stitches and added some beads . 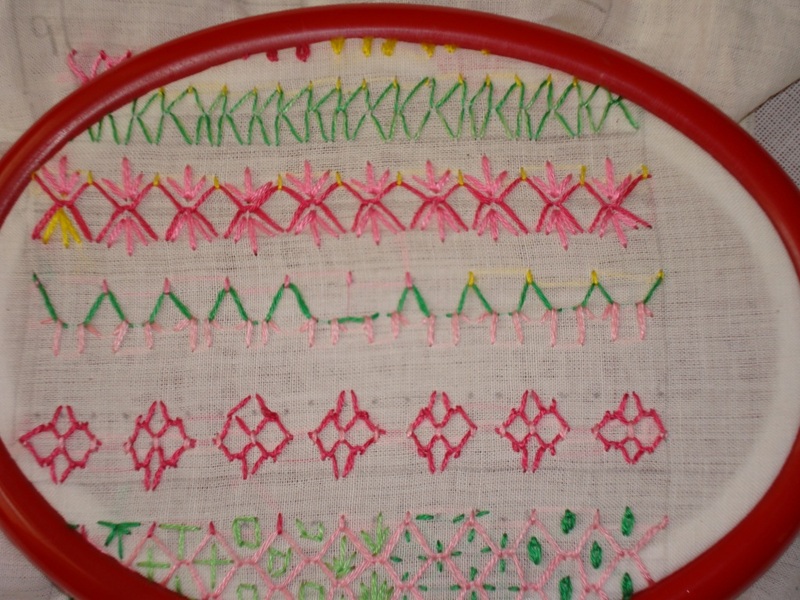 first motif of sword stitches is with detached chain stitches. 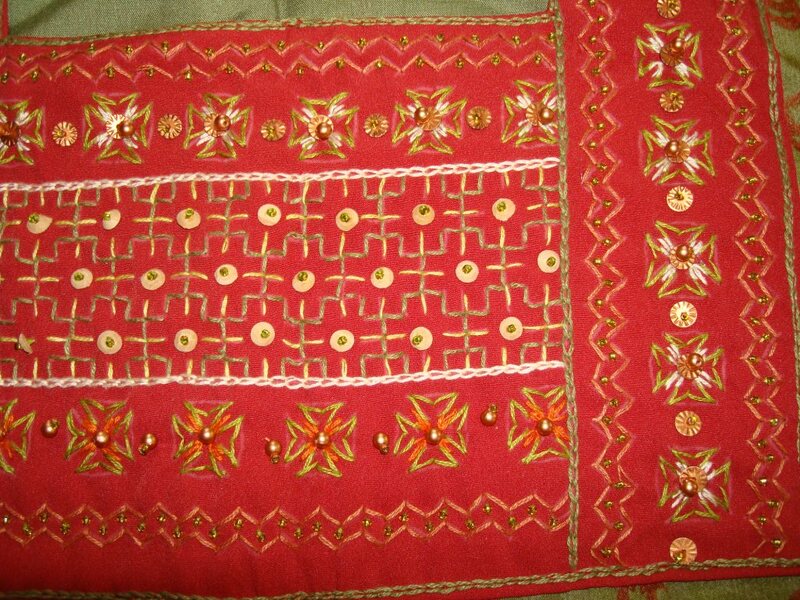 2nd motif,I did a small needle threading at the centre, with a circle of sword stitches. 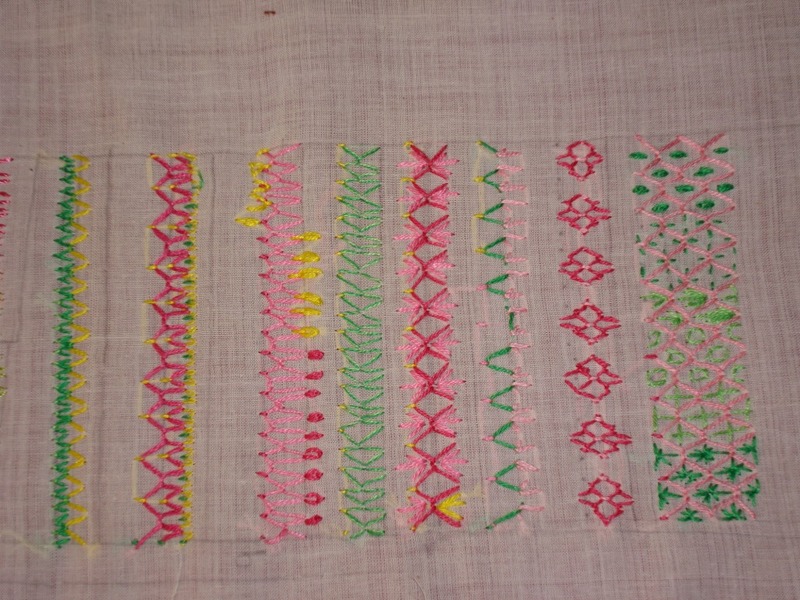 Last row is collection of 3 sword stitches going in 3 directions. 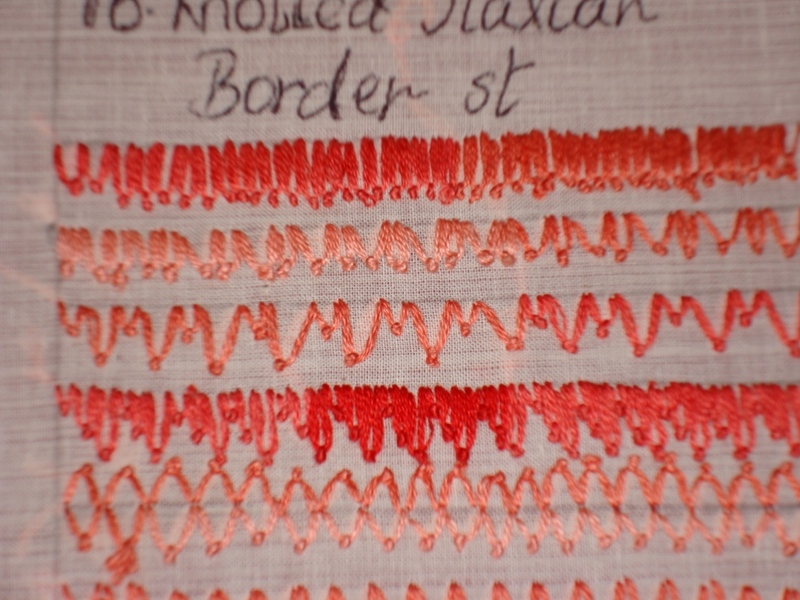 I liked the stitch, and the colours I used for this sampler. 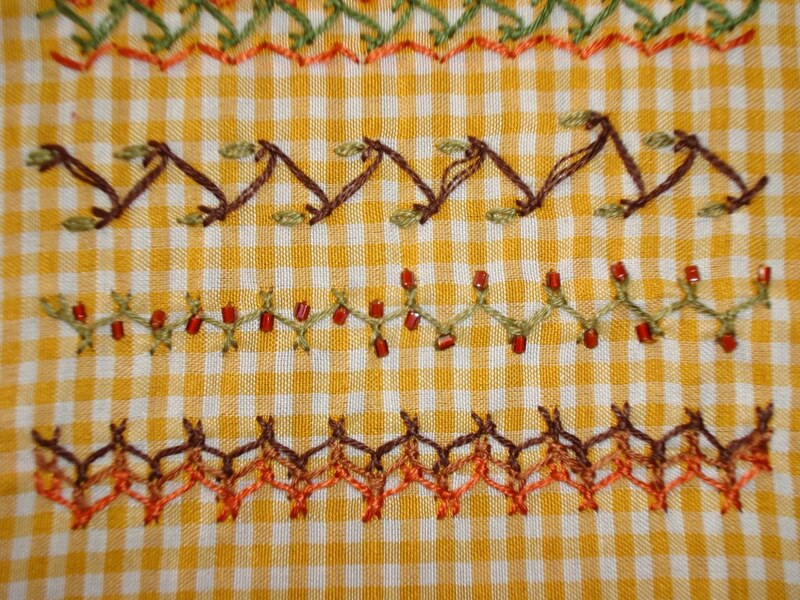 Very simple stitch.Can also be used as a filling stitch. TAST 2010 16.Italian knotted border st.
To start off, I tried this stitch for the first time. next line, the narrow and wide version of this stitch is alternated. 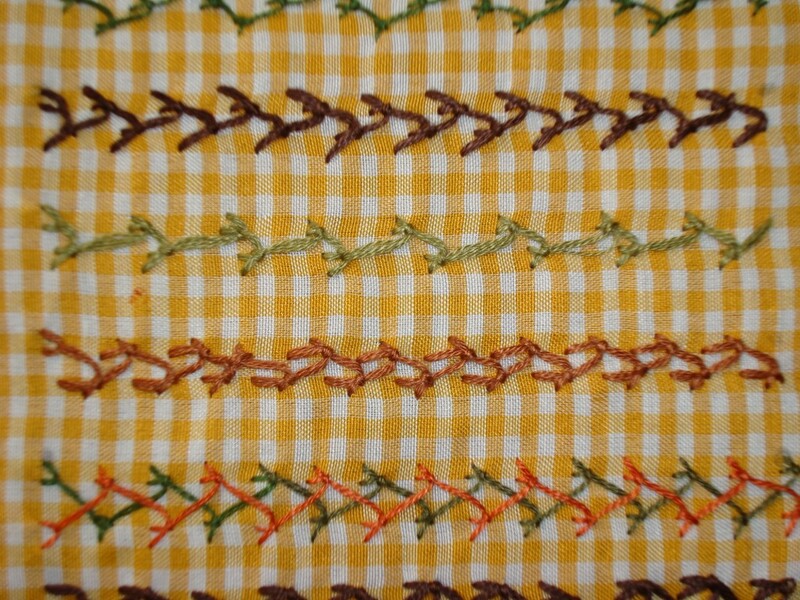 3rd line-as you can see, one stitch is short and next one long. I tried varying the heights of the stitch. 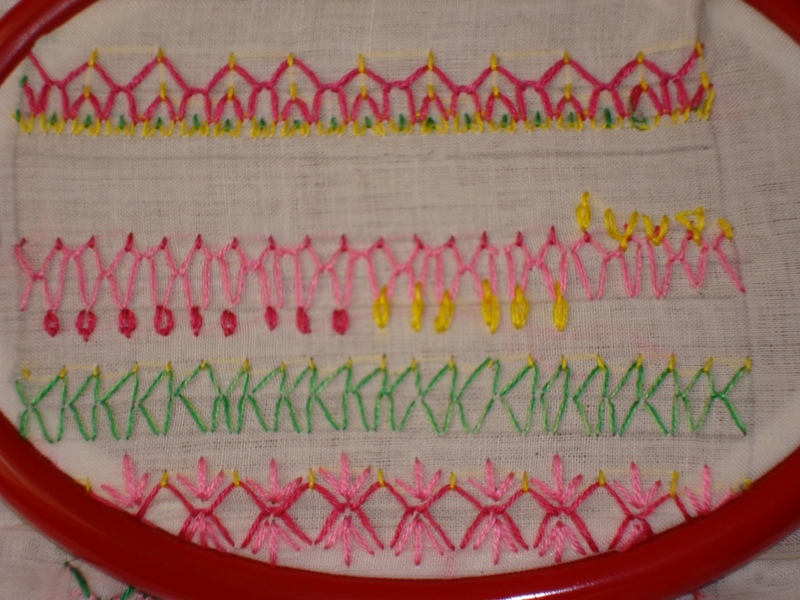 In this- 2 lines of the stitch, facing each other. Next, just two lines of the stitch. 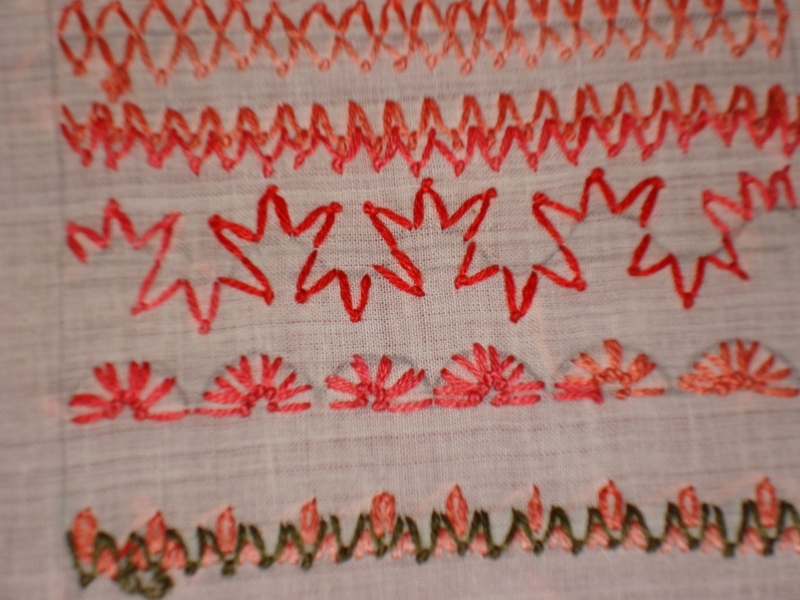 this stitch is a trial of decorative seam,just by adjusting the placement of the stitch. Arranged the stitch in a semi- circle. detached chain st ,fly stitch are added to a line of this st. 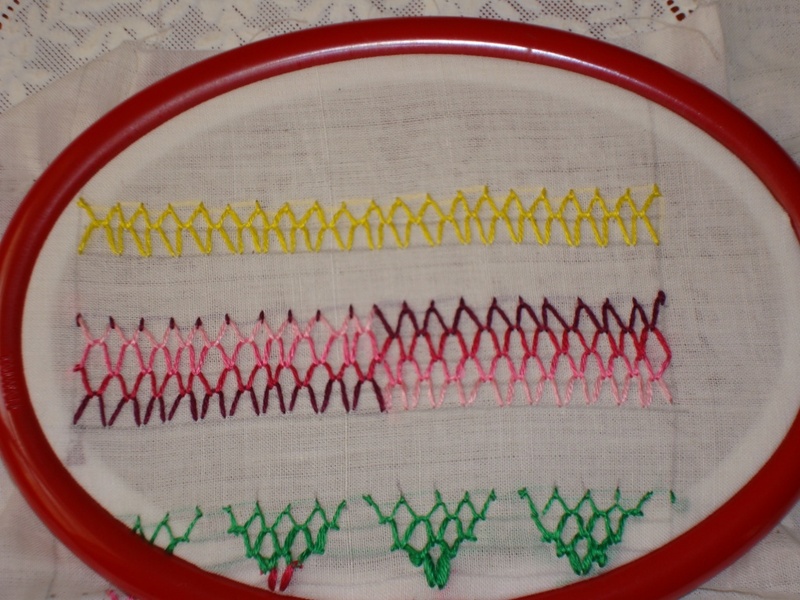 The line is made of the stitch in 2 colours. 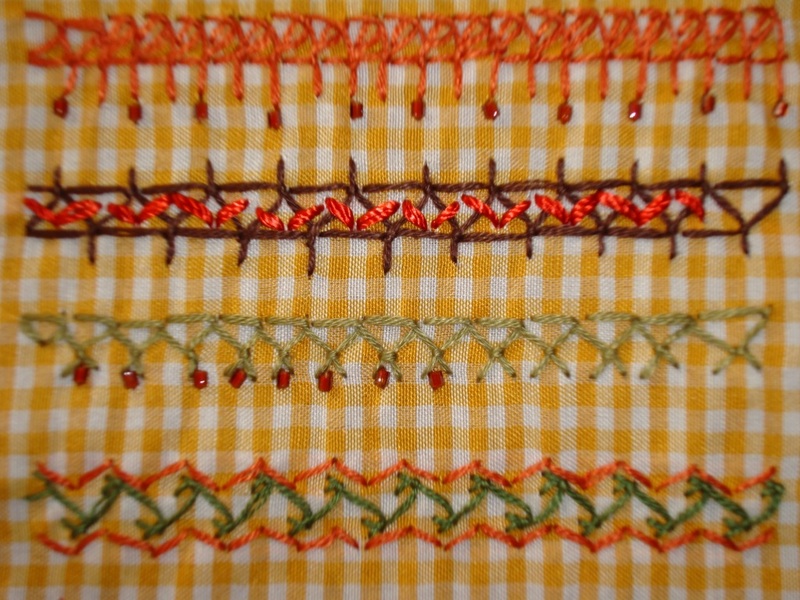 A line where I alternated between the basic stitch and its inversion, embellished with beads. Laced this line with a thicker thread. I whipped the last line of this stitch. 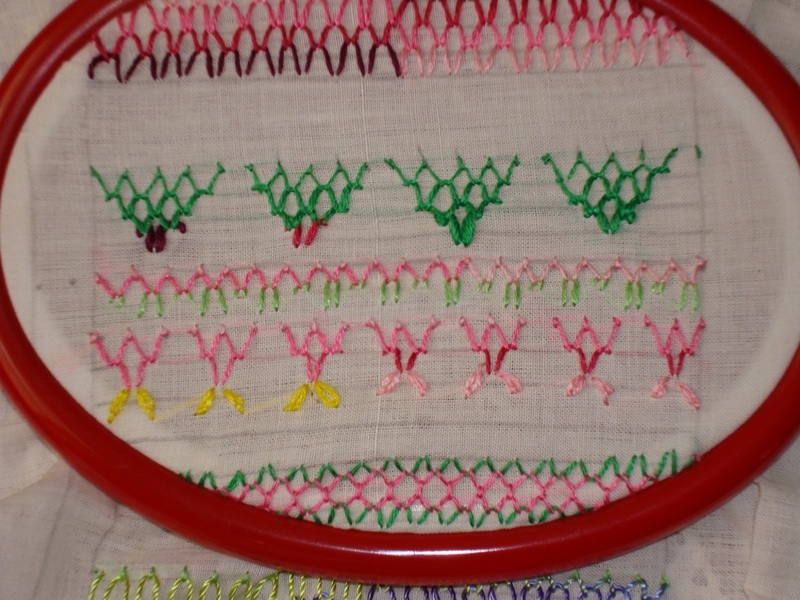 This is a very beautiful stitch., can be used in place of fly stitch as a decoration. The stitch will look better if done on an evenweave. 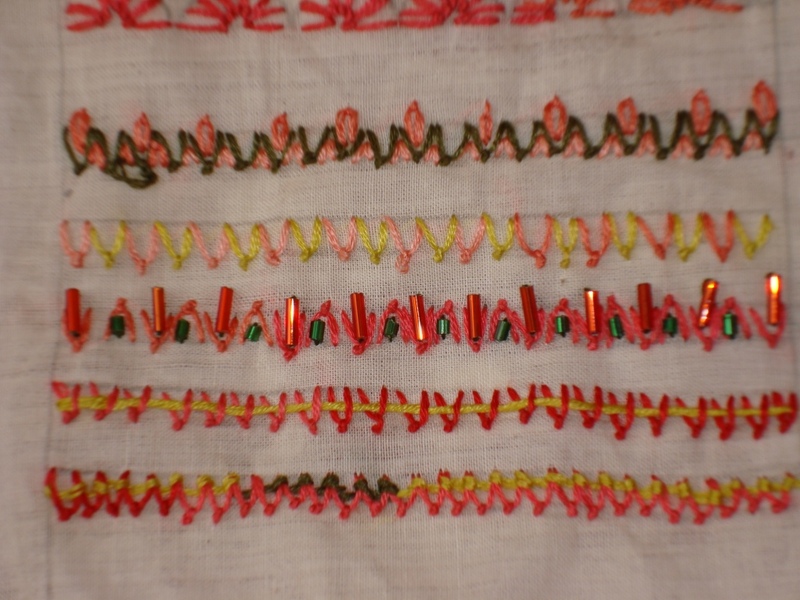 I keep changing the fabric, to see how each stitch appears on them. And my personal library of stitches is also growing. 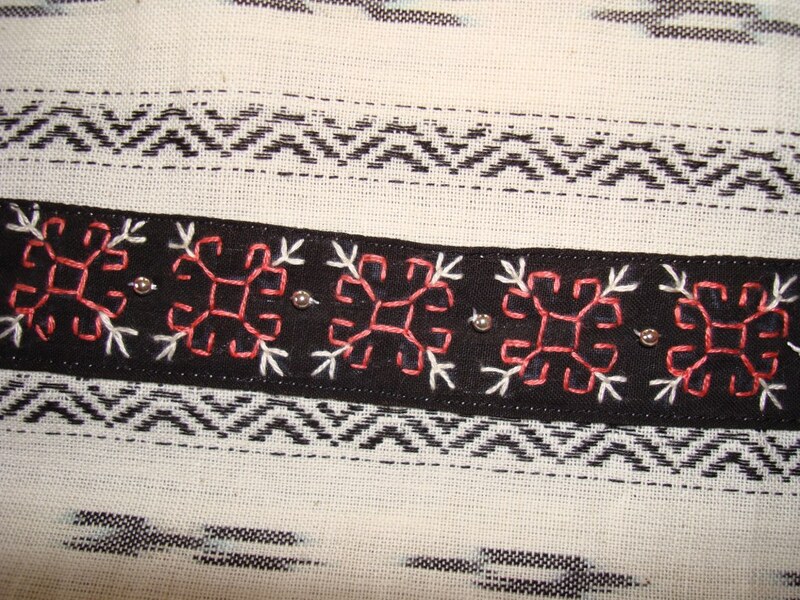 I wanted to try some blackwork border for tunic.This tunic is handwoven ikat fabric in white colour.I did the blackwork pattern on black fabric. First , the whole pattern was drawn on a graph paper- A central panel, 2 side panels and 2 borders for sleeves. while I was doing the embroidery,the pink looked ok. After attaching it to the tunic, it looks a bit dull.I am quite fond of this fabric.